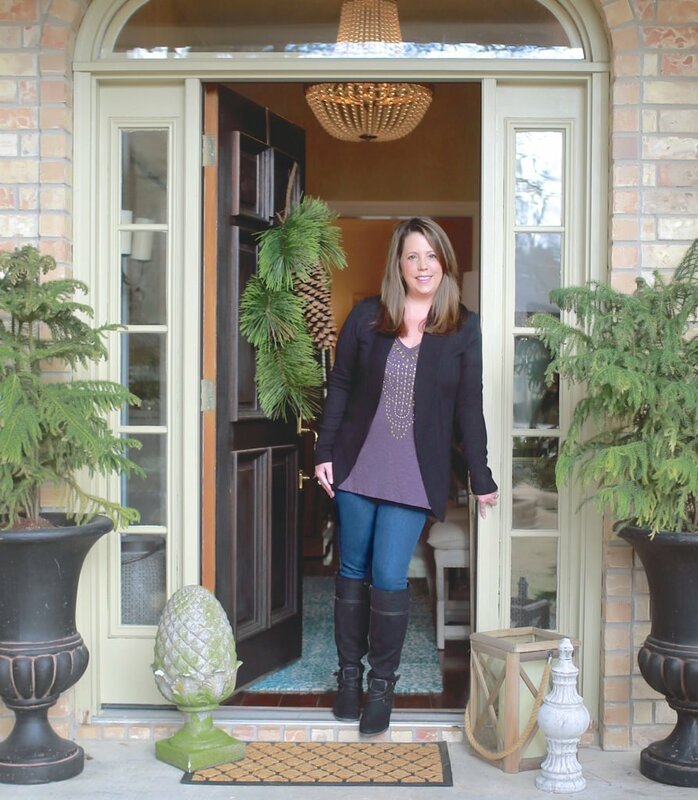 My husband, Keith, and I walk in the evenings through our neighborhood as well as some adjacent ones, and I’m often amazed at some of the outdoor living spaces we see—welcoming porches, tranquil decks, stunning outdoor kitchens, and even gorgeous outdoor fireplaces. Today we’re looking at creative outdoor fireplace designs. 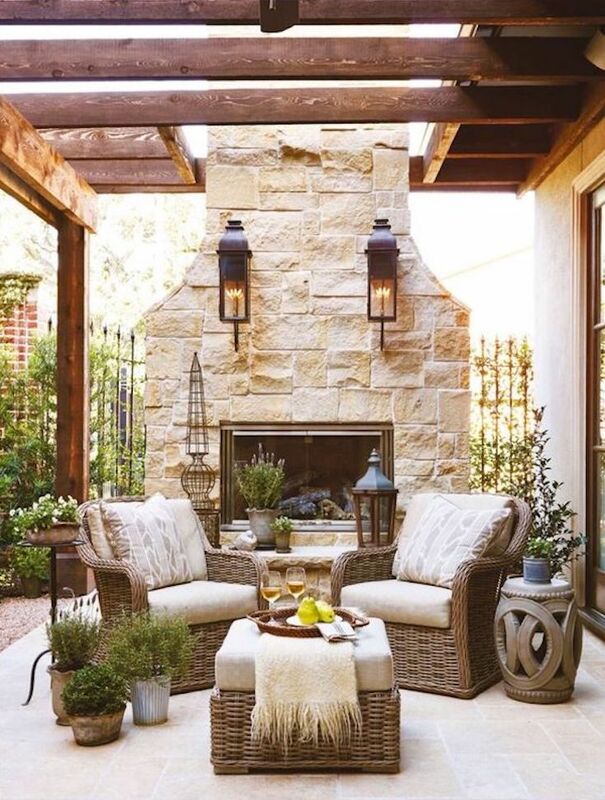 These creative outdoor fireplaces warm up your outdoor living area and set the scene for a cozy, relaxing outdoor retreat. 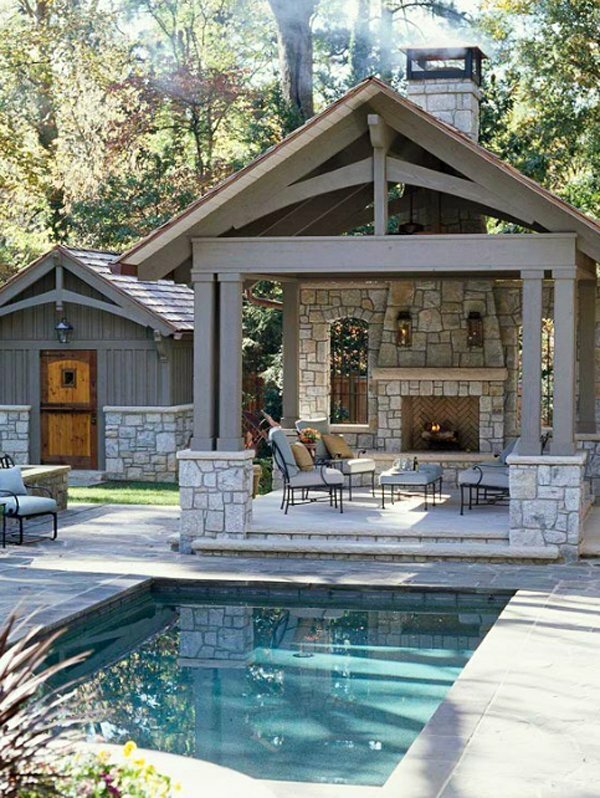 These luxurious outdoor rooms feature covered seating spots nestled in front of beautiful outdoor fireplaces. 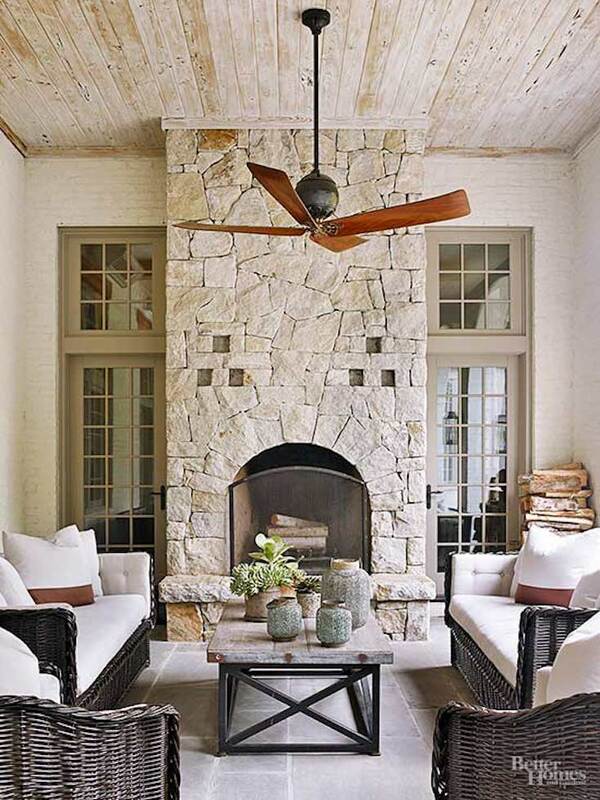 The arched stone fireplace in this outdoor room is so inviting. I suspect I could spend many happy hours curled up in front of it. 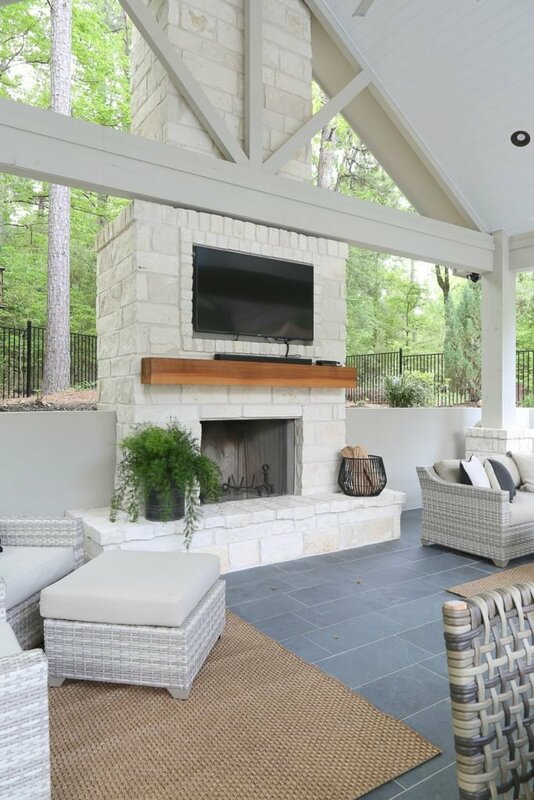 Complete with a gorgeous fireplace, comfortable seating, and even a television, this outdoor room offers something for everyone. Imagine warming up by this lovely fireplace after taking a refreshing swim. 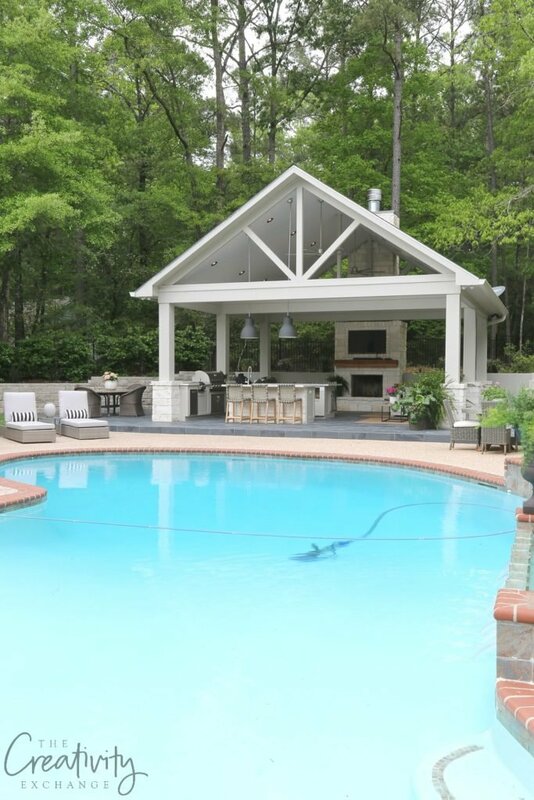 Cyndy just built an outdoor kitchen/pool house that you can see here and she used a fireplace insert (which is much cheaper than doing a solid masonry fireplace). I want to sit next to this graceful fireplace, under the pergola, with a glass of wine and my best friend all afternoon. 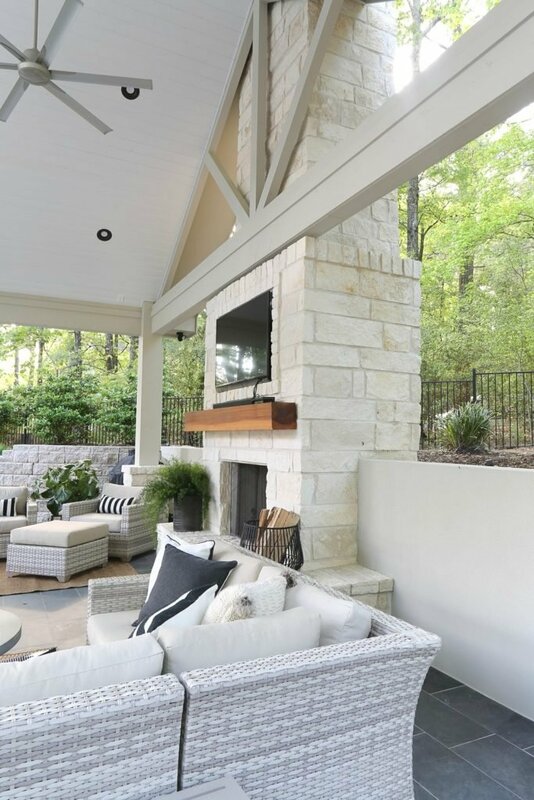 This pergola-covered patio featuring a charming stone fireplace is the perfect spot to retreat to in the evening. 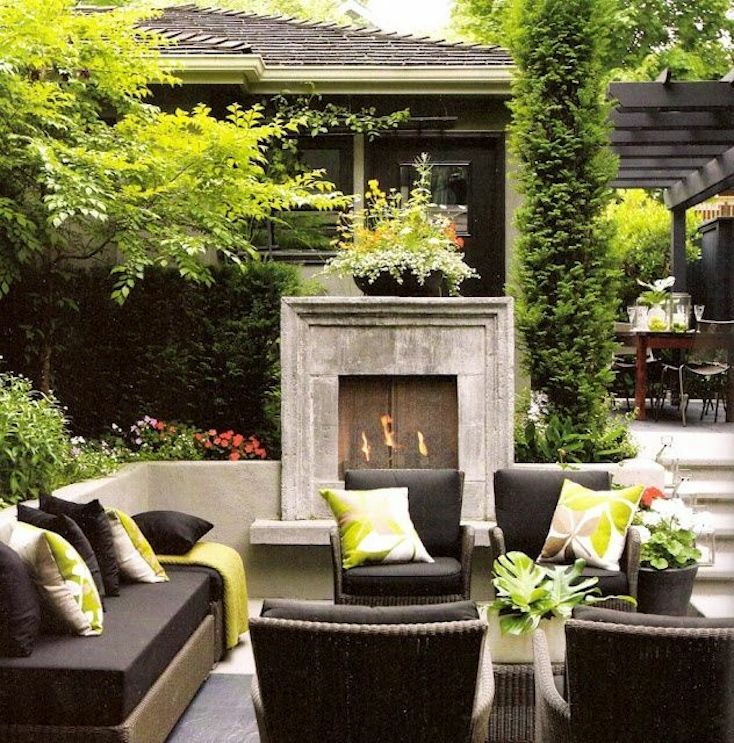 For a more casual but no less beautiful option, these patio fireplaces offer striking seating areas you’ll be drawn to. The stately built-in fireplace on this patio is large yet still inviting. I love the clean, simple lines of this elegant concrete fireplace. 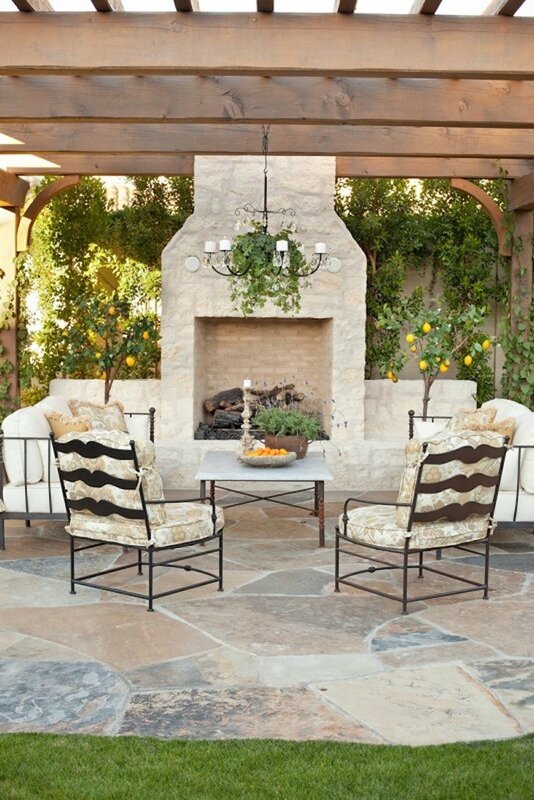 The circular seating wall on this patio draws your eye to the slate and stone fireplace. What a focal point. 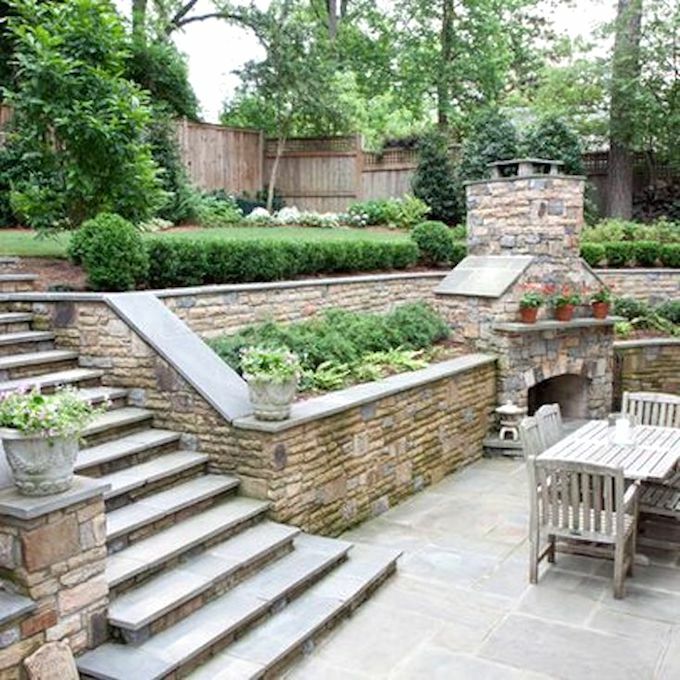 The sturdy fireplace built in to the retaining wall of this pretty terrace makes the space so much cozier. If you want your outdoor fireplace to stand alone, these simpler designs might better fit your style and space. 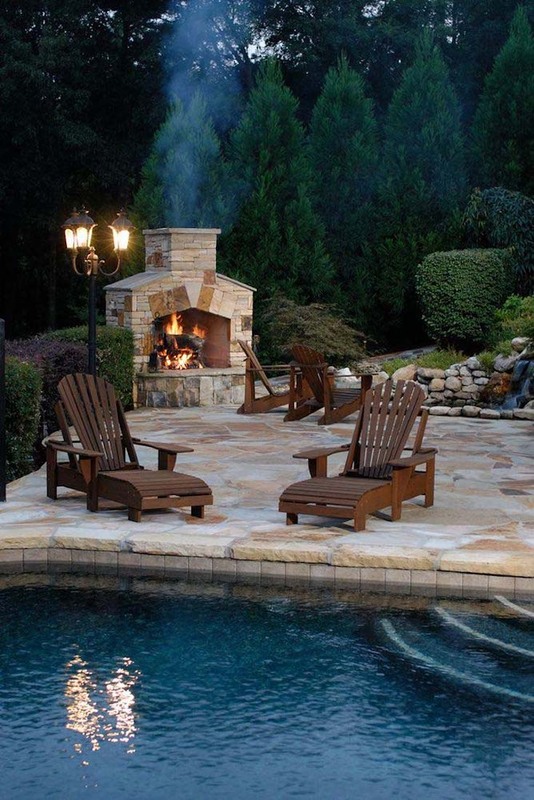 Here’s another great pool-side fireplace. The stonework on the fireplace as well as the surrounding patio is nicely done. 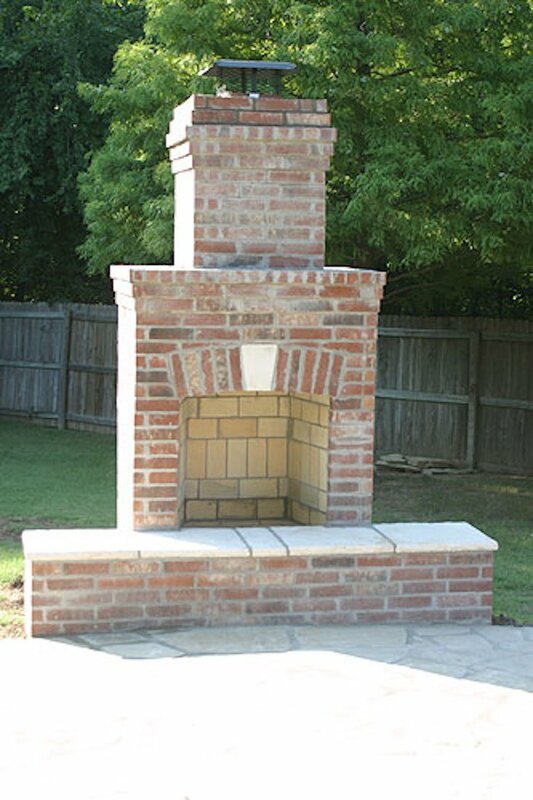 This brick fireplace is simple yet striking. 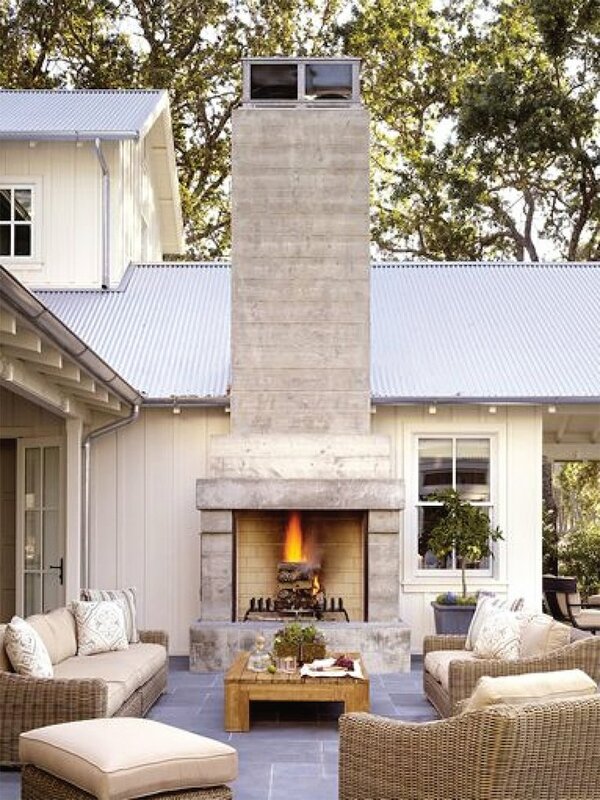 It’s a fantastic option for a smaller-scale outdoor fireplace. 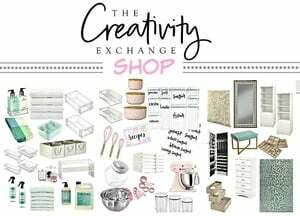 Our outdoor living spaces are becoming about as important as our indoor spaces, so why not make them gorgeous, comfortable, cozy places to spend time? 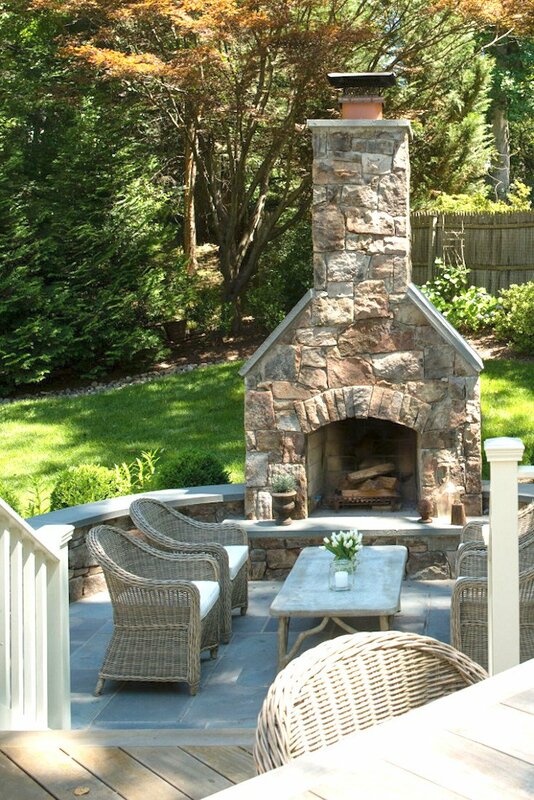 An outdoor fireplace can help make your outdoor living area a wonderful place to be.